Engaging Teachers makes a deliberate attempt to reclaim the education discourse captured by new right politics and connect it with a radical democratic agenda for schooling. On its agenda are education markets, policy, leadership, professionalism, and communities. Engaging with these is conceived on at least two levels. First, as an invitation to teachers to become involved in reconstructing schooling for socially just purposes and in democratic ways. From this perspective, the politics of engagement is not simply a matter of acquiescence or resistance but is informed by a commitment to generate alternatives: teachers, parents and students making things happen rather than having things done to them. Also signalled is an intent to work collectively, exploring and acting on common interests and across uncommon ground. 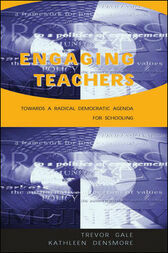 Second, the book also celebrates teachers engaging in these reconstructive efforts in attractive and meaningful ways. The attraction is decisions about schooling made by those they affect as well as decisions that are meaningful because they engage the interests of all.